41 countries participated in the 24th World Age Group Competition (WAG) Dec 3-6 in Odense, Denmark. This provided fabulous international competition experience for both Jessica and Delilah. 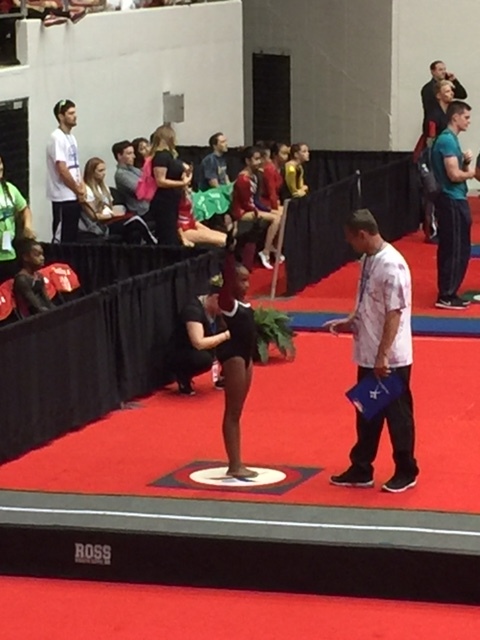 Saturday, Jessica competed against 80 girls from 29 different countries in 15-16 individual women’s trampoline. She completed both routines, albeit a little conservatively, proving to be a very valuable learning experience. 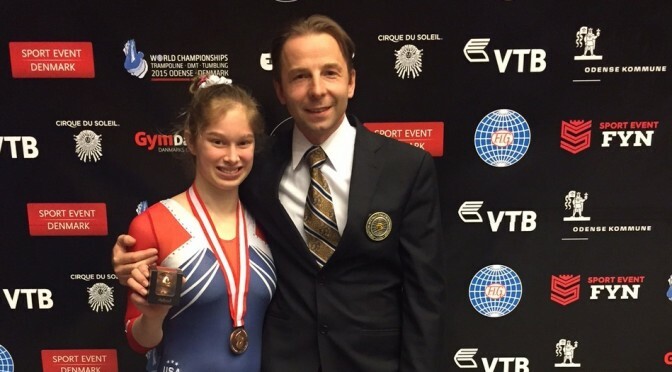 Sunday morning, Delilah competed against 52 girls from 23 countries in 17-18 individual women’s trampoline. She was the second athlete to compete and set the tone for the day by completing two beautiful routines. Jessica then paired up with Courtney (ETA) for 15-16 women’s synchro competition Sunday afternoon. They competed against 28 pairs from 19 countries. Jessica and Courtney finished in 7th place in the qualification round earning a spot in finals competition. They modified their routine slightly for finals competition, completed it beautifully and with great synchronization, and ended up capturing the bronze medal! Way to go! Although, the athletes did not get to explore Denmark too much as they spent almost all of their time in the competition venue, they had a great opportunity to pull together with athletes from all over the country to form one unified Team USA, as well as interact with athletes from all around the world. Congratulations to all our athletes who competed this past weekend at the Region 6 Championships! USA Gymnastics divides the US into 6 geographic regions for Trampoline and Tumbling. We are in Region 6, which includes: Connecticut, Delaware, Massachusetts, Maryland, Maine, New Hampshire, New Jersey, New York, Pennsylvania, Rhode Island, Virginia, Vermont, West Virginia, and the District of Columbia. This was the largest Regional Championships to date – 595 athletes. Fairland is proud to have 30 Regional Champions, 20 Silver Medalists, and 9 Bronze Medalists! Fairland is also excited to bring home several Team Awards: Compulsory level Trampoline, Compulsory level DMT, and Optional level DMT. We also added a few more National qualifiers! After the first meet of the year back in January, I told myself I’ll draft a post next week. How time flies! It’s been way past a week! Our athletes have had some great achievements! I would love to list them all, but we’d need an e-book not a website! Results for all meets are in the process of being posted under the results section of the website. It is great to look back and see the progress our athletes have made! 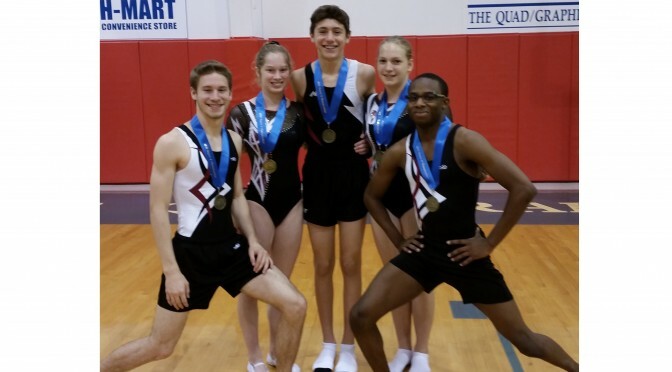 Seventeen of our compulsory level athletes kicked off 2015 with the GymCats Invitational in Martinsburg, WV. 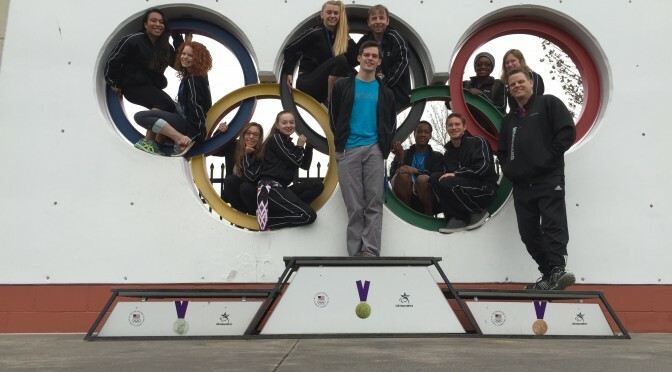 February brought about the President’s Cup in Dumfries, VA. Level 7 and up athletes then traveled to Greensboro, N.C. for the Atlantic Coast Trampoline and Tumbling Invitational. This was an exciting meet as this was the first team travel meet for several athletes! 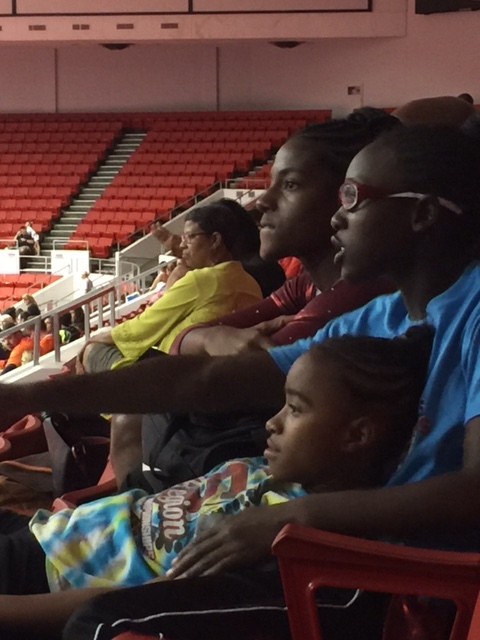 It also gave the level 8 and up athletes a chance to check out the area where Nationals will be held. March . . how can we forget . . .The Fairland Classic! What a fun experience for all! April was about as busy as it could be! Several levels 5-9 athletes attended the Unique Invitational in Waldorf, MD. The following week was the Maryland State Championships, which Fairland is proud to have 40 State Champions (does not include synchro) and 60 National Qualifiers (34 athletes)! 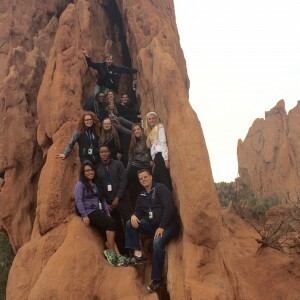 Three days after the State Meet, our level 10 and elite athletes traveled to the Olympic Training Center in Colorado Springs for the Elite Challenge! What a fabulous experience that was! High level T&T on all three events, as this was the final selection event for the Pan Am Games and the first qualifier for the upcoming World Championships in Odense, Denmark. What’s next, you ask . . . Region 6 Championships in Martinsburg, WV. The meet promises to be an excited one as approximately 590 athletes from 13 states plus the District of Columbia are registered! (Should this number be our goal for next year’s Fairland Classic?) 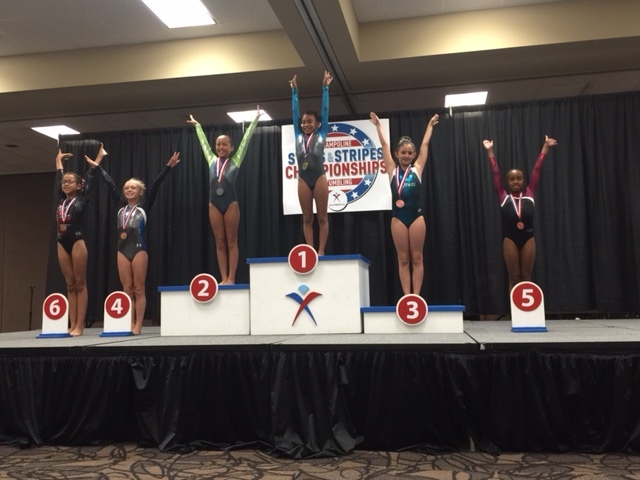 The USA Gymnastics Championships (level 8 and up) will be June 23-28 in Greensboro, N.C. and the Level 5-7 National Championships will be Jul 16-19 in Fort Worth, TX. Go Fairland! Good Luck to all our athletes! Team USA / Jessica wins GOLD! Yesterday was day 3 of the World Age Group Competition and included synchro for the 13-14 age group. Jessica and Ginger (ETA) performed a solid routine in the qualification round to earn them a third place finish and a spot in finals competition. All 8 finalists completed their routines with no interruptions. Jessica and Ginger stayed strong and did even better in finals and won the GOLD medal! They had the highest difficulty of all 13-14 women. Congratulations Jessica! Awesome competition: Individual trampoline finalist and synchro gold medalist. You represented the US and Fairland well! We are so proud of you! Jessica competed this afternoon in the 23rd World Age Group Competition in Daytona Beach, FL. Jessica completed 2 awesome routines in qualifications-scoring a new personal best and qualifying for finals competition! This evening she competed in finals and unfortunately fell mid-way through her routine (yes, she is ok) finishing in 8th place. Jessica is the top USA finisher in the 13-14 age division! 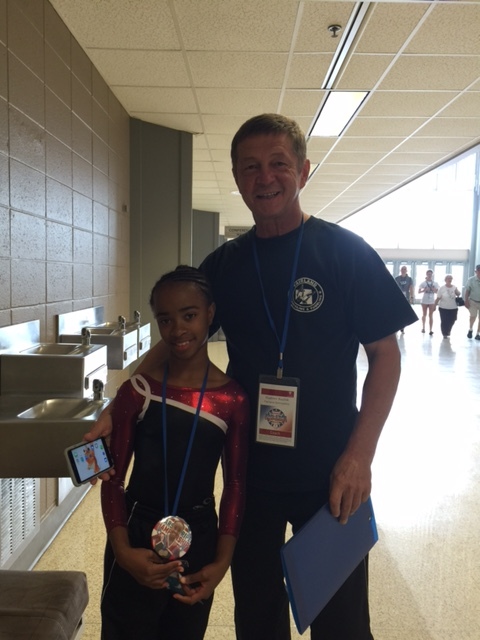 What a great experience for her first time competing in the World Age Group Competition! We are proud of you! 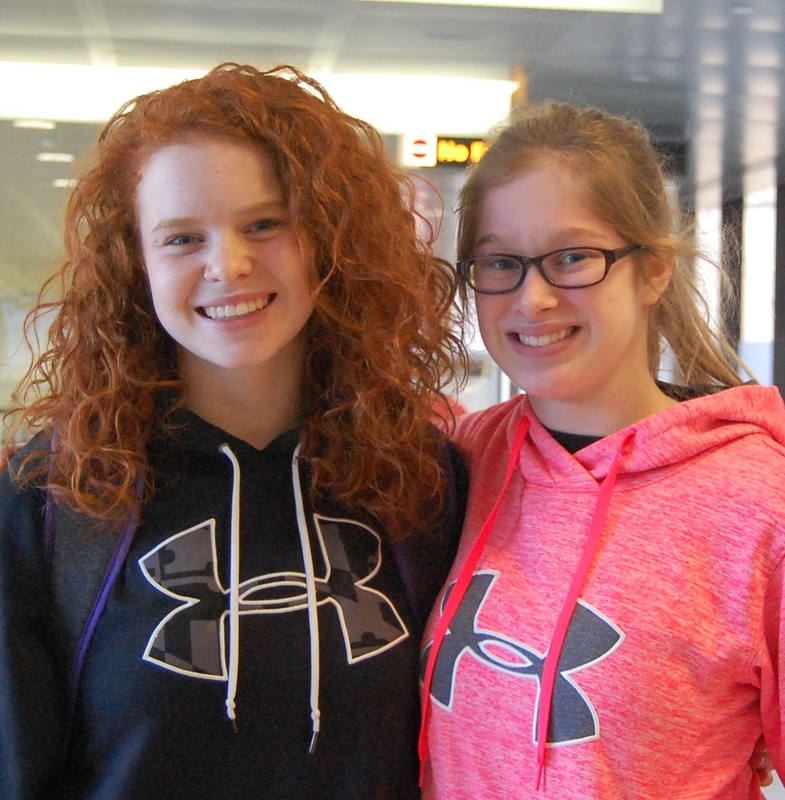 Tomorrow afternoon, Jessica will pair up with Ginger (ETA) to compete in synchro. Good luck Jessica and Go Team USA! Samara, Neomie P., Korey, and Grant competed in the Season Opener Welcome Back Invitational this past Sunday at Skyview in Mount Airy, MD. Samara won level 5 trampoline and double mini. Grant tied for first place in level 5 double mini. 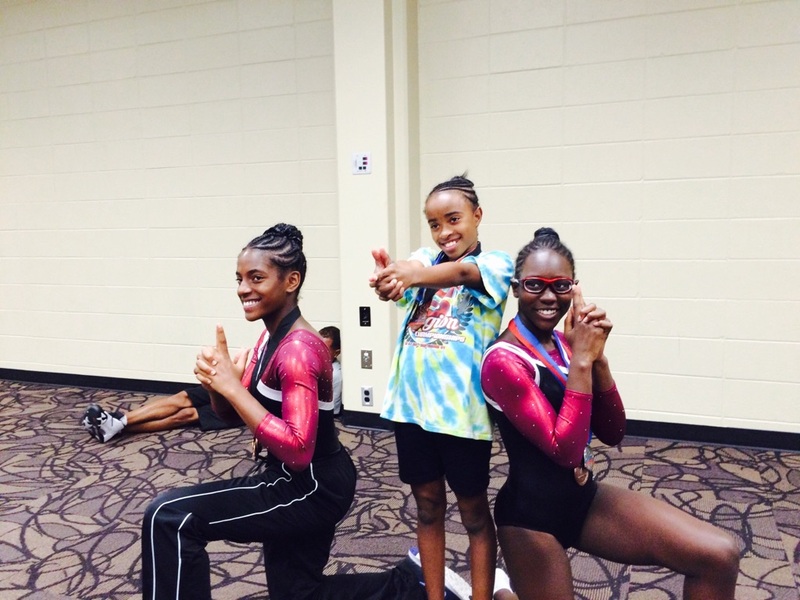 Korey won level 6 trampoline and double mini, and Neomie P won level 7 trampoline and placed 3rd in level 7 double mini. Great job! Way to start the season! Congratulations Alex B. 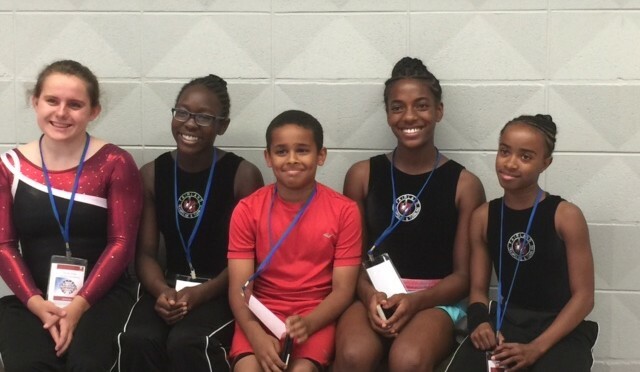 And Lindsay for making the 2015 Elite Development Program (EDP) Team for 13-14 year old boys/girls trampoline. All EDP Team members will participate in an International Training Exchange camp at the Olympic Training Site in Huntsville, TX in January. Congratulations Alex and Lindsay! We are proud of you! Welcome home Fairland athletes and coaches! The Slavic Games provided so many learning experiences for our athletes: food, money, language, (big) time change, hotels that still use actual keys (not cards), underground tunnels/walkways, bus tour, museum: so many stories—such exhausted kids! More importantly, our athletes gained so much experience and learned a lot from competing in an international competition as well as being able to watch the finals competition of the World Cup. We are very proud of all 5 athletes (Sean, Lindsay, Lily, Jessica, and Delilah). Fairland brought home 3 medals! Sean paired up with Andrew from T&T Express to win the silver medal in Senior men’s synchro. Jessica won the bronze medal in individual trampoline (13-14 girls). Delilah paired up with Sophia from T&T Express to win the bronze medal in Senior women’s synchro.